In recent years, juicing has become a popular go-to for weight-loss and cleansing enthusiasts. Advocates of juicing include doctors, dieticians, and celebrities who all tout the benefits of the juicing lifestyle. Although juicing can sometimes cause more harm than good when done incorrectly, the well-researched juicer will see a number of benefits from the practice. When trying to decide if juicing is right for you and your health goals, it’s important to research and understand the different benefits and disadvantages and to consider all aspects of juicing as it pertains to your life and goals. Juicing, by definition, is the extraction of juice from fresh fruits and vegetables. Juice made from whole foods, not to be confused with smoothies which usually have added ingredients such as dairy, is rich in vitamins and minerals with a high water content. Typically, though not always, juicers remove the pulp from these fruits and vegetables. This removal can be a double-edged sword. Some juicing advocates claim that the lack of fibers found in the pulp makes the vitamins and minerals in the juice easier to digest and absorb into the body, while others say that the fiber is necessary for proper digestion. In addition, leaving these fibers in the juice can make it more filling, which is beneficial to those trying to lose weight. A typical home juicer will cost somewhere between $50-$500 with many in that range offering a variety of benefits and disadvantages depending on the desired outcome for your juice. Unsurprisingly, advocates of juicing say that juice is better for the body while opponents believe that whole fruits and vegetables are better. Comparisons between juiced foods and their whole counterparts have shown that both have their own advantages and disadvantages. Juices typically have higher water content by percentage, and lower calorie content. In addition, juices have less fiber, but more carbohydrates. Although claims made by juicing proponents would say otherwise, juices usually have less vitamins and minerals than whole foods because much of those nutrients are in or near the skin of the foods which are removed with the pulp. All of the nutritional differences between juices and their corresponding whole foods are derived from the removal of the pulp during the juicing process. There are two main reasons for juicing. These include cleansing/detoxing and weight loss. Regardless of your reason for juicing, the vegetables used should always be raw and organic and, if possible, should be purchased from a reliable source. Many proponents of juice cleanses claim that juicing can help clear out toxins such as aspartame and other things found in processed foods. Whether this is true or not, juice cleanses are an effective way to clear out an unhealthy diet and start from scratch. This is less about a short term cleaning of the body and more about starting good habits and getting a solid foundation for healthy eating so that your body is functioning properly all the time. It’s important to remember that it’s not usually a good idea to jump straight into a juice cleanse without some preparation, particularly if your body is used to eating greasy or processed foods. This can cause digestive discomfort and other health issues that are easily avoided by working your way into your cleanse. If possibly take 2-4 weeks to prepare your body by slowly cutting out processed food and replacing it with raw or organic foods. 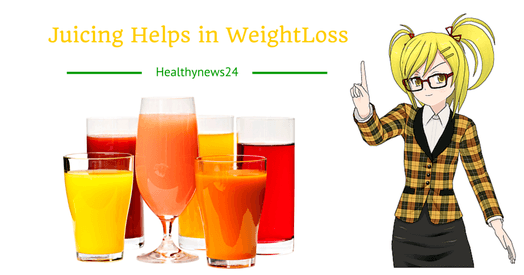 There are two methods of using juice for weight loss. The first and more extreme way is to do a fast. This entails cutting out solid foods entirely and replacing all meals with juice. It is definitely recommended to not do this for more than three days at a time and not recommended for those new to juicing. In addition, a juice fast is worthless if you don’t bother to change your diet at the end of it. A better way to use juicing for weight loss is to supplement your diet. Juices are a good alternative for snacks in the diet or as a single meal replacement instead of replacing all of your meals. Also, if you're using juicing for weight loss it’s important to remember to use more vegetables than fruits. Juicing is a fantastic way to ensure that you’re reaching your daily recommendation for fruits and vegetables. The CDC recommends 2 cups of fruit and 2 ½ cups of vegetables for a day based on a 2000 calorie diet. Unfortunately, in 2010, the CDC reported only about 33% of adults were meeting this recommendation. Admittedly, it can be difficult to fit all of that into your daily diet, but juicing can help. Juices can be made from fruits and vegetables, so they can be very helpful in meeting these minimum recommendations because you can consume more of the nutrients in one sitting. When buying a juicer it’s important to determine what exactly you would like it to do and what your plans are for the juice you make. There are three basic types of juicer: fast, slow, and whole food. Fast juicers are more common and often the cheapest option for a juicer. These are great for someone who is looking to just add fresh juice to their diet to accompany meals. The juice from these juicers does not typically contain any pulp and, although they are very fast, they don’t usually provide much juice per whole food. The lack of pulp makes the juice less filling, so this type of juicer isn’t ideal for someone looking for a snack, but it’s great for someone who has difficulty fitting in all their servings of fruits and veggies or looking for a healthy alternative to store bought juice. Slow juicers are slightly more expensive, but can offer a little more bang for your buck. Although they run slower, they also provide more nutrients and more juice overall. The juice from slow juicers is crushed then pressed, so some, but not all, of the pulp comes out. This makes these juicers better for someone who is looking to use their juice as a nutrient-rich snack. Whole food juicers are better for someone looking to replace full meals with their juiced. Most of the pulp comes out with the juice making them thicker and more like smoothies. Not only does this make the juice more filling, but it also provides more vitamins and minerals in this form. Different fruits and vegetables provide different nutrients that are helpful to the body to function properly. A common ingredient in weight loss juice combinations is lemon juice. Lemon juice has been shown to help increase weight loss and metabolism. Beets are also very popular for weight loss juices because they are helpful in increasing liver function and the liver helps to metabolize fat. The following combinations of juices are all aimed at aiding in weight loss. In addition to the benefit of weight management, these juices aid in a variety of other health concerns including heart health, skin health, and bone health. Ingredients should be processed in a juicer, then shaken or stirred and served immediately. In addition to lemon juice, the kale in this recipe offers a big nutritional kick with very few calories. This helps to feel fuller while keeping the calorie count low. Spinach and beets both have high levels of iron which helps build blood. This creates a better supply of oxygen which gives the body more energy. Not only is this drink helpful in weight loss, but the carrots, oranges, and beets are also helpful in keeping cholesterol levels down and, in turn, preventing heart disease. While the lemon and kale in this drink can help with controlling weight, the silica found in cucumbers can help keep a clear complexion. This refreshing drink is great for a low-calorie afternoon snack on a hot day. The mix of lemon juice, kale, and spinach keeps calories low while the cucumber and apples help keep a bright and clear complexion. This pretty drink offers an energy boost and strong, healthy bones due to the presence of pears. High levels of boron in pears aids in bone health, while fructose and glucose give a natural burst of energy. Previous Post TESTWORx Testosterone Booster Supplement Review: Realites & Facts Next Post Why Good Sleep is Related to Longevity.